Entrepreneurs and small business owners typically don’t believe they can learn anything useful from the biggest and most successful companies in the world. After all, brand building at-scale is typically very different than brand building in the startup and small business world. Nevertheless, smart entrepreneurs and small business owners pay careful attention to important market forces and trends that shape some of the world’s best brands. These entrepreneurs and small business owners know that despite the many differences between large and small companies, important insights that can help shape their marketing strategies. 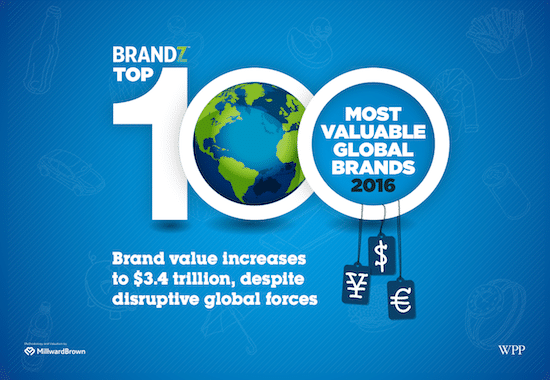 BrandZ publishes an annual most valuable global brands report. The 2016 Brandz Top 100 Most Valuable Global Brands report offers important branding lessons for startups and small business. Google is listed as the most valuable global brand, with Apple, Microsoft, AT&T and Facebook rounding out the top five. It’s remarkable that all of the top five brands are technology companies. In fact, the only non-technology company in the top 10 is McDonalds (at number 9). 1) Disrupt yourself before you become disrupted. Disruption was one of the key trends in the 2016 rankings. Interestingly, three of the fastest rising brands – Amazon, Starbucks and Facebook – continued to disrupt their own business models. It’s remarkable that only a few years ago, Facebook didn’t have a mobile strategy. Today, most of Facebook’s billions in earnings comes from mobile. There are many products and services in the marketplace and a lot of noise. Smart brands attempt to be omnipresent and useful to their customers. The best brands deliver great value. Just look at how Amazon has managed to build many multi-billion dollar industries while delivering terrific value to consumers. We take this to heart at crowdSPRING. We’re currently overhauling our entire product – replacing every pixel and line of code and rewriting every line of copy, in order to deliver better value to our customers and prospects. 2) Integrate your marketing efforts. One common mistake made by many small businesses and startups is to assume that once they have a great logo, they’ve created their brand and now just need to do a little bit of marketing. A brand is more than logo design. But marketing efforts can fall flat if you lose credibility with your marketing collateral. You must keep an eye on branding (easier for the world’s biggest brands – they can spend billions building their brands) because it’s too easy to make a branding mistake that can cripple your small business. For example, if your branding is inconsistent or consistently poor in email and content marketing campaigns, people will notice. For example, the millennial dad is not the stereotypical errand boy-man, mindlessly checking off items on his partner’s shopping list. He is often the shopper and decision maker, and therefore a person brands need to get to know better. With the rise of mobile banking, the counterintuitive surprise about millennials is that they sometimes prefer to bank in the physical world first, establishing trust through a face-to-face encounter, before transacting online. Millennials pay for goods and services not only with cash, but with other currencies, including their time and their data. 3) Have a clear and consistent brand purpose. Great brands have genuine, clearly articulated and consistent missions. Successful startups (Uber, Basecamp, Airbnb, MailChimp) often share this trait. Here’s an interesting read on Airbnb’s branding and mission, from a few years ago when Airbnb rebranded. Higher purpose seems to work best when it is a natural extension of the brand’s functionality. In the car category, Volvo returned to its emphasis on safety, a genuine purpose that helped drive sales. Tesla appeared for the first time in the BrandZ™ Cars Top 10 as a brand providing high performance and low carbon impact. 4) User experience is a key differentiator. Customers are looking for a flawless, frictionless experience and typically have little patience when the experience is less than perfect. Many years ago, companies could offer a poor customer experience and customers would tolerate that poor experience because there were few options for customers. This is no longer true. There are numerous options for nearly all customers, and poor experience is a sure way for a startup or a small business to lose customers and go out of business. Just look at cable-cutters and the amount of business lost by traditional cable companies (that have, historically, had terrible customer service and experience). Brands that are meaningfully different tend to be more successful. Consumers are looking for “a bit more” from most brands – not just the products and services they purchased. This is an opportunity for smaller brands to deliver great value and personalize products, services, and communications. For example, Drift wasn’t a market leader in messaging/lead generation, but they’ve made up for it by focusing on a powerful content strategy (posts, podcasts, transparency) that has given them a good lift in a very competitive market. As an example, here’s a recent post from their blog where Drift shares all of the email content it sends to customers and prospects. 5) Innovation and a higher purpose attract talent. Millenials are naturally drawn to technology brands. But equally important, brands that innovate and have a higher purpose appeal most to younger employees. This is a global trend, and evident not just among the worlds biggest companies, but also evident among startups and small businesses. For example, McDonald’s (the world’s 9th best brand) is moving its headquarters back to the West Loop Chicago (from a suburb) in order to attract younger employees. The West Loop is already home to many startups (including Basecamp, Threadless, crowdSPRING, Respect, Startup Foundry, and many others). But location is only one factor. There’s a reason that technology companies dominate the top 10 in the 2016 rankings – nearly all of these companies are considered innovation leaders. 6) There are advantages to being local rather than multinational. Along with the desire for less expensive products, several other factors drive this trend, which is especially evident in FMCG [Fast moving consumer goods] categories. First, local brands have gotten better in quality and marketing, in part because they have learned from multinational competitors. Second, consumers increasingly prefer local brands for nationalistic or other reasons. In India, for example, consumers feel that local brands better understand and respond to the country’s rich diversity. Finally, consumers in these fast-growing markets also look for brands that act as partners in helping to build the nation. To many consumers, local brands seem more likely to pursue this purpose. Smaller brands can compete with big brands because you can reach the consumer anywhere, physically or virtually. But even for local business, you must have a web presence to reach consumers virtually. 7) Not all customers are the same. In an age more tech-driven than ever, Gen Z is raising standards for brands. Even with the proliferation of omnichannel, interactions are expected to be more human, benefits higher-order, and offers more individually relevant. Close attention to this generation – leveraging the vast amounts of behavioral data it generates wherever possible – is crucial for building lasting connections, outpacing evolving needs, and ultimately winning with the consumer. The best brands also understand that blindly attaching your brand to various opportunities is fraught with peril. For example, many brands mistakenly attach their marketing efforts every October to Pinktober (celebrating Breast Cancer Awareness Month). What other advice would you offer small businesses and startups building their own brands?